The WYSIWYG (What You See Is What You Get) editor is the area of the Writeroom where your text and media come together. We created a powerful WYSIWYG interface that lets you see what you page will look like as you edit it. Below, the various formatting options are explained in detail, and some quick shortcuts are also detailed. The formatting options available are all shown in the top bar of the Editor. You can use these options to make small changes to the format of your document. You can hover over each option in the Formatting Bar to see its name, and the function of each formatting option is detailed below. If you&apos;re working on a small screen, or have multiple panes open in the write room, you might not see the whole Formatting Bar. However, you can click on the More option to expand the full menu. The Style option is used to set the size and weight of different sections in your document. For example, the title of a major section could be set in the Header 1 Style, while smaller sub-menus use progressively smaller Header options (this might look familiar because that&apos;s how this page was made!). The Theme Style option holds style options that are specific to the Theme that you&apos;re using. These can vary greatly from theme to theme, especially if you&apos;re using your own custom theme. We&apos;d recommend checking the documentation for your specific theme if you have a question about one of its options. Bold makes your text letters thicker than the surrounding text. Italic makes your text letters slanted. Originally it was meant to mimic the look of cursive, but it&apos;s also a great way to draw attention to a specific part of your text. Underline does what it says on the box - It draws a line under the words. Highlight will add a background color to your text to help it stand out more. Code is used when you&apos;d like to display some code in-line with your text. The look of this can even be changed with Code Styles. 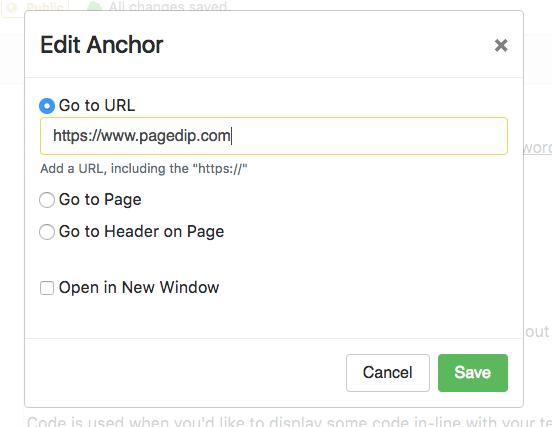 Anchor is similar to a Hyperlink, but it has some added functionality that&apos;s specific to Pagedip. To create an anchor, select the word(s) you&apos;d like to be interactive, and click the Anchor button. This brings up a window that lets you set what the Anchor should do. The various options are detailed below. This allows you to quickly select a page in the Pagedip you&apos;re editing to go to. When you select the option, you&apos;re presented with a "Mini Page Tree" that you can use to select the relevant page. This option takes the Go to Page concept one step further, and lets you select a specific Header on the current page to go to. Note that this only works within your current page, so you can&apos;t use this option to go to another page&apos;s Header. If you want your reader to look at another page or link without directing them away from your Pagedip, you can tick this box so the link will be opened in a new window. Bulleted lists are generally used to list out items when order doesn&apos;t matter. Numbered lists are generally used when order matters, and the reader is expected to go through them in order. List Styles are Theme-specific changes that can be applied to your list. If you have questions about an option available in your Theme, we&apos;d recommend contacting the Theme&apos;s creator. The Edit Embed button let&apos;s you change the details of the embed, such as the Name and URL. Note that you must have an Embed selected with your cursor before you&apos;re able to click the Edit Embed button. Embed Styles are Theme-specific changes can be applied to an Embed. If you have questions about an option available in your Theme, we&apos;d recommend contacting the Theme&apos;s creator. The Bink button allows you to turn a selected word or phrase into a Bink. These can be used to add an additional layer of content to your work. You can use the Remove Bink button to remove it without deleting the text it&apos;s attached to. Note that when you remove the Bink, any content inside it will be deleted.